Rider Information Buckenham House group does not have the facilities for carriage driving. 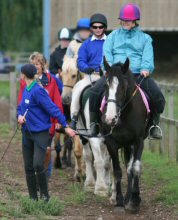 Buckenham House Group RDA provides riding for both children and adults with physical and learning disabilities. Our instructors have experience of teaching riders with a range of disabilities but for riders with more complex physical problems they can call on the advice and expertise of the RDA Norfolk county physiotherapist who is a member of the ACPTR, Association of Chartered Physiotherapists in Therapeutic Riding What can riding offer a disabled person? 1. Improvements in co-ordination, posture and muscle tone. Horse riding can improve the balance and positioning of people with a range of disabilities such as long-term neuromuscular disorders or neurological impairments as in cerebral palsy or learning disabilities. The movement of the horse is the same as when walking so it can strengthen muscles but the smooth repetitive movement decreases tense muscle tone or spasticity. Because of the interaction with the horse or pony, riders may find their RDA sessions more interesting and motivating than regular physiotherapy sessions. Improvements in balance and co-ordination can be made through the use of games and activities. Exercises on horseback can stretch and strengthen muscles. 2. Developments in communication skills Communication with a horse is mostly physical so riders with learning disabilities who may have poor speech or hearing and therefore difficulties with communication realise that they can communicate and this can encourage them to speak or sign with their helpers. 3. A challenging new activity In the Buckenham House group, riders are not just taught to ride but are also encouraged to learn more about their horses and how to care for them. They learn about parts of the horse and tack and the practical skills of grooming and tack cleaning. Buckenham House group uses the RDA proficiency tests in riding and horse care to recognise their riders’ abilities. 4. An opportunity to succeed RDA gives the riders an opportunity to succeed. When possible the group takes interested riders to events specifically for disabled competitors such as the RDA east region championships and the Special Olympics. We have also had riders qualify for and take part in the annual RDA National Championships at Hartpury. All our riders are encouraged to aim for their individual ambitions whether they are competitive achievements or reaching a personal target. What do the riders get out of RDA? Adults Parents and carers of adult disabled riders comment on how much the riders enjoy their lessons and how it improves their confidence and self-esteem. They comment on improvements in balance, posture and co-ordination. 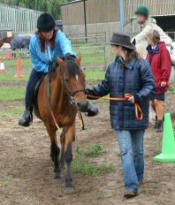 RDA also provides fun and friendship and provides a social life for riders who may not mix much otherwise. If you are, or care for, a disabled person you think might benefit from the work of Buckenham House Group RDA you can apply for a place in the group. Please fill out a rider application form by clicking on this link. Once the form has been filled out and signed by a doctor and responsible adult, please send to the group chairman at the address on the top of the form. You are of course welcome and encouraged to come and watch a lesson and talk to the instructor before making your application.